Senior Wayne Anderson, No. 7, fights his way in the back field looking for holes to make a play. He had nine carries for 34 yards during the game. Prosper fell to Allen 54-21. Tonight, the Prosper Eagles face Plano at 7 p.m. in their John Clark Stadium. 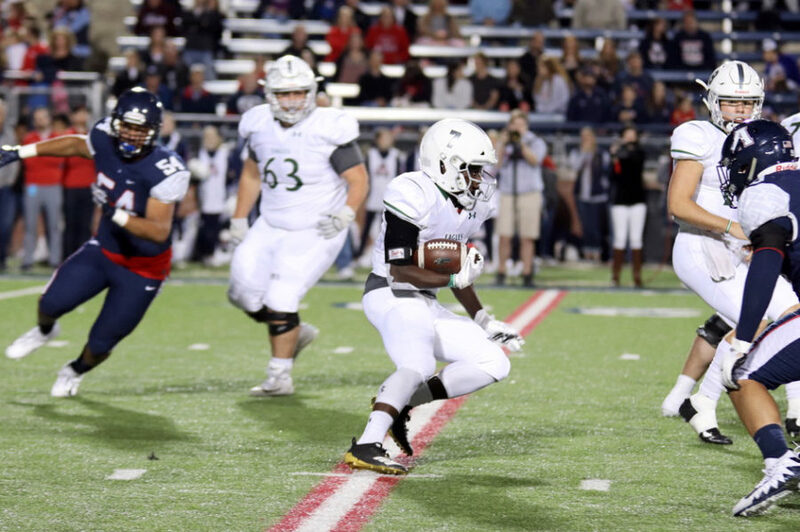 Prosper’s 26-0 hole to start the game against Allen proved costly in their 54-21 loss against the Allen Eagles (9-0) Friday night. The slow start from the Eagles allowed Allen to gain all the momentum they needed to clinch the District 9-6A title. The Eagles, though, will be looking to add to the winning side of their record on the road at 7 p.m. tonight against Plano. The loss to Allen provided Prosper (7-2) with a sense of reflection as to where they stand with other top teams in the area. Although it took time to get both sides of the ball in function, the team played much better in the second half than the first. If the Eagles were able to play better early on, they would’ve had a shot at making the contest with Allen competitive. With Allen, there is little to no margin for error for Prosper and other teams who want a shot at shocking the powerhouse. However, the Eagles will look at a chance to finish the season strong and redeem themselves today in their final game against Plano (5-4). The Wildcats enter Friday on a three-game win streak. Plano prevailed against Jesuit, McKinney Boyd, and – shockingly – Plano East, who defeated Prosper earlier in the year 26-14. The 5-4 record from Plano seems misleading, as they have seemed to find their groove in the late part of the season. Plano’s quarterback Cole Winnett comes off an impressive four touchdown performance in their latest game against McKinney Boyd. The Eagles need to make sure this isn’t another quarterback that dominates their defense, much like what Allen quarterback Grant Tisdale did in his four-touchdown performance last week. The Prosper defense struggled for much of Friday, allowing a whopping 646 total offensive yards to Allen. In comparison, Prosper’s offense only came up with 206 total offensive yards against Allen’s defense. The driving force of Prosper’s offense all season, the rushing attack, provided little to no production. Although J.T. Lane found the end zone two times for touchdowns, star Wayne Anderson had a quiet 34 yards on the night. An uncharacteristic night from senior Anderson was a major factor into Friday’s outcome. A fast start will be the key to the squad gaining all the momentum and walking away with a strong victory heading into the competitive 6A playoffs. This game should be a chance to give other players on the Prosper team an opportunity to shine and give the team confidence heading into the state playoffs in the next few weeks.